The 1931 Aluminaire House, as The Architect's Newspaper (AN) has reported, was left adrift in New York (its birth home) and then sent packing last week in a big rig to Palm Springs, California. The Lawrence Kocher and Albert Frey-designed house arrived safe and sound and was welcomed to Palm Springs in an official ceremony with dignitaries at the Albert Frey-designed Tramway Gas Station. While it’s sad to see the house leave New York, it does make sense for the all-metal structure to ‘retire’ to the sunny dry desert. 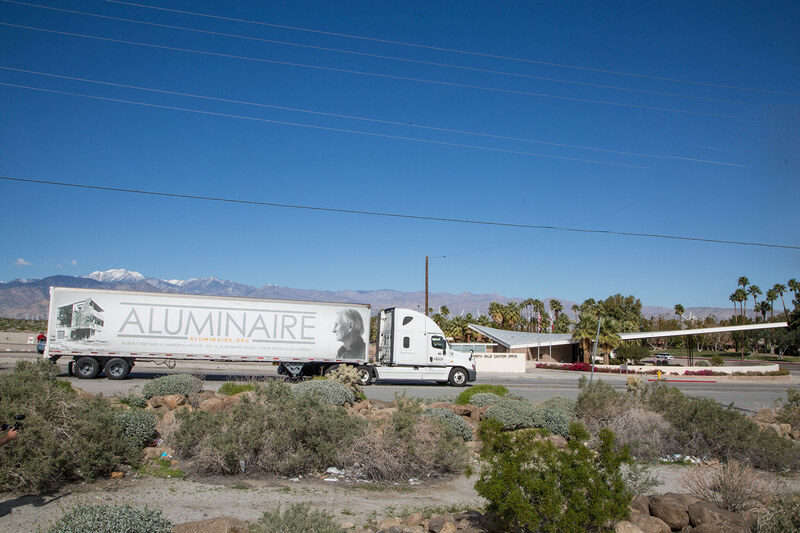 Architects Michael Schwarting and Frances Campani worked for years to save the Aluminaire from destruction and oblivion, but when it became obvious that New York no longer wanted the structure and Palm Springs did, they decided to ship it to Frey’s long-time home on the desert. The container holding the house will be parked on south Palm Canyon Drive throughout Modernism Week (which runs February 16 to 26). After Modernism Week concludes, the container will be stored in the Palm Springs City Yard. It is meant to be included in the plans for the new Downtown Park. 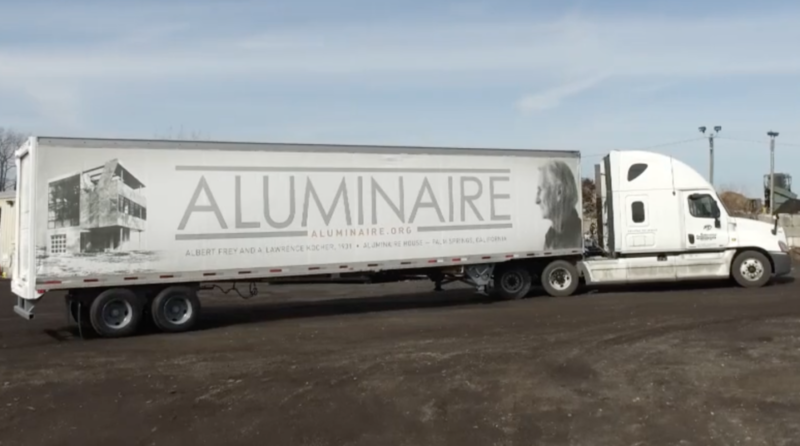 Once the park is completed (date to be decided) and the site for Aluminaire prepared, the home will be reassembled and opened for the public to tour. 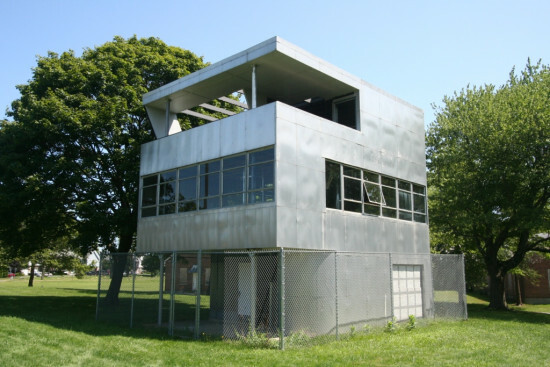 The Aluminaire House, designed by A. Lawrence Kocher and Albert Frey, will depart from storage in Long Island, NY on February 9th and travel across the country to Palm Springs, CA for Modernism Week, the annual celebration of midcentury architecture and design in Palm Springs. Originally built as a prototype for the 1931 Allied Arts and Industries and Architectural League of New York Exhibition, the house was an early modernist exemplar for the use of off-the-shelf building materials in residential architecture. After the exhibition closed, the structure was relocated from Midtown Manhattan to the estate of architect Wallace Harrison where it remained until the late 1980s. Passing through the stewardship of several owners who altered and expanded the house, it eventually fell into disrepair and was threatened with demolition. As a result of preservation efforts by historians and architects, the structure was moved in 1987 for the fourth, and purportedly final, time to the Central Islip Campus of the New York Institute of Technology where it was fully restored. However, its life on Long Island was relatively short lived. In 2012 the campus closed and the house was again disassembled and move into storage, out of the public’s view. Following negotiations with the City of Palm Springs, the Aluminaire House Foundation, led by Michael Schwarting, Kenneth Frampton, and Frances Campani, secured a permanent site for the house in a new downtown park which is slated for completion later this year. As such, the reassembled house will not be on display during Modernism Week, however it will be the subject of a lecture on February 25 and fundraising event later that day at the Siva House designed by Hugh Kaptur. When the house is finally reconstructed, a permanent board of directors will take over its care and offer regular hours for public viewing. For more on Modernism Week, see its website here. The landmark Aluminaire House is homeless yet again. The situation is not so out of the ordinary, however, as preservationists and communities have recently been confronted with the futures of these pioneering modernist structures. In this particular battle, a team of architects is hoping to relocate the historic house, which has already been disassembled and rebuilt three times, to a vacant lot in Sunnyside Gardens, a landmarked district in Queens. The proposal to reassemble the house as part of a low-rise residential development at 39th Avenue and 50th Street is facing uncertainty from residents who would prefer the site be turned into a community park. Architects A. Lawrence Kocher and Albert Frey designed Aluminaire as a case study in 1931. 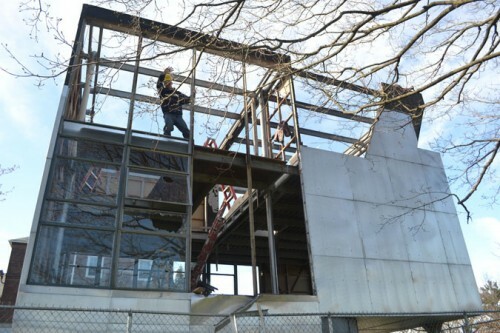 Constructed of donated materials and built in ten days, the first all-metal, prefabricated house in the country debuted at the Allied Arts and Industry and Architectural League Exhibition. Subsequently, the house was sold to architect Wallace K. Harrison who disassembled and moved it to Long Island. New York Institute of Technology then reassembled the structure on its campus, which has since closed, leaving the structure to the Aluminaire House Foundation, which has disassembled and stored it. The Foundation now seeks a low-rise, high-density New York neighborhood to display the building as it was initially intended – as a low cost urban home prototype. Residents are concerned that the house’s design does not belong with the area’s traditional brick housing scheme. 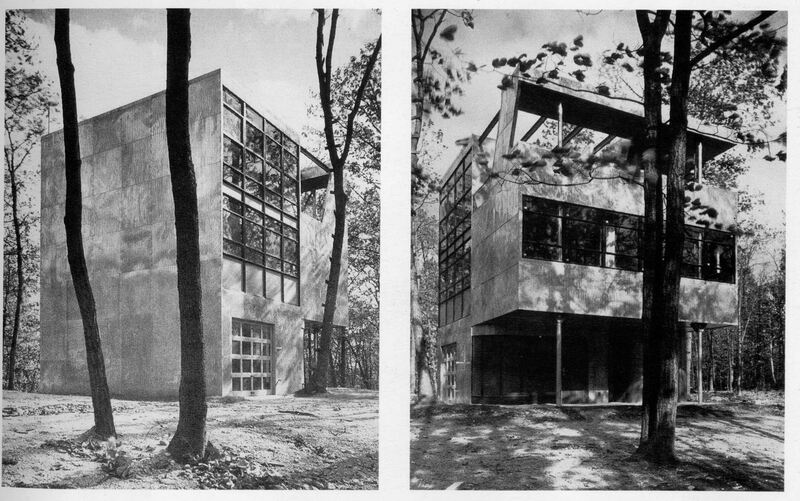 Still, Sunnyside Gardens and Aluminaire have a history together—they were both featured in a 1932 MoMA modern architecture exhibit. Reconstructing the house in Sunnyside would actually place Aluminaire within its planned context. The project embarked on its lengthy journey through the public approval process at Community Board 2’s Land Use Committee meeting last month. The foundation is scheduled to present to the commission in September. For now, the house is in storage.